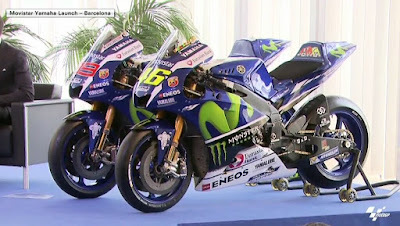 The factory Yamaha team gathered in Barcelona to show off what their 2016 bikes will look like as they aim to repeat their 2015 success. 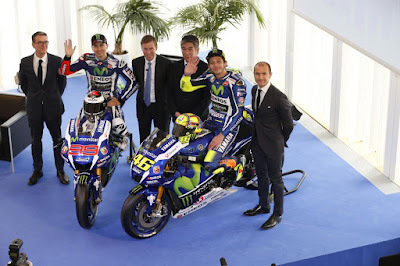 Movistar Yamaha MotoGP revealed their 2016 MotoGP™ World Championship machine on Monday in Barcelona. The factory Yamaha team were the first to show off their new bike as the build up to 2016 continues. 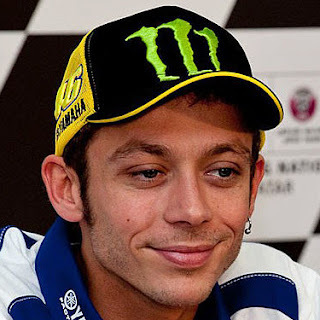 It is a year of changes for MotoGP™ riders and teams as new technical regulations are introduced, including common software and a change to Michelin tyres. The team and riders now begin their final preparations for the first test of 2016, held at the Sepang International Circuit on the first of February. Tests will also be held in Philip Island and in Qatar before the season kicks off on the 20th of March under the floodlights. Movistar Yamaha MotoGP revealed their 2016 MotoGP™ World Championship machine on Monday in Barcelona.